When you pick up a beer bottle and find the cold, impassive eyes of Al Capone staring at you from the label you know it's going to mean business. A thick, dark stout is imprisoned in this black bottle. A brooding and menacing thing that rattles a tin cup against the bars and maintains steady and unshaking eye contact with whoever dares to walk past its cell. I know this because three years ago I had my first run-in with Anarchy Brew Co's Sublime Chaos Stout. This is the same beer but hardened by time behind bars. It's done a nine month stretch, solitary confinement within a Pinot Noir barrel. 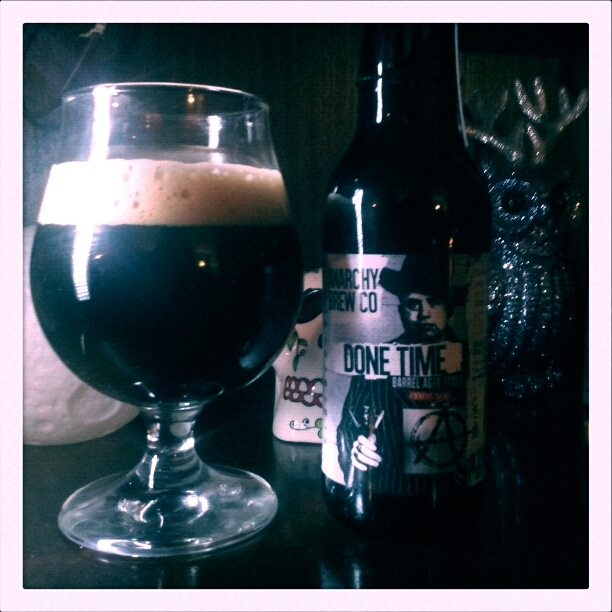 And now it's time to slam down the lever and uncage this barrel-aged thug. The scent bursts from the neck, a screaming and deranged orchestra of dark, rich, decadently dangerous aromas. There is full and rugged red wine, a scent boosted by the malt and chocolate notes from the beer, a scent not so much full-bodied as prison sculpted; a colossus wrought from endless hours in the exercise yard and a hefty diet of contraband steroids. A hearty inhale rewards this reporter with a quickly-blooming Cognac stench, rich and gorgeous and underlined with hints of pipe tobacco and leather. Burned wood is there too. The sensation of a plush drawing room, once filled with smoking-jacketed sensualists but now consumed by fire, is conjured and banished by a slow rumble of chocolate that gradually swamps the ashen remains. The beer pours with halting slowness, thick and oily, an unsullied black which gathers at the bottom of the glass like petrol poured into the stomach of a traitor. A one centimetre head of thick, tight, tiny bubbles tops off the dark fluid, while that powerful miasma of grape and dangerous luxuriance streams upwards towards the ceiling and the senses. The first taste is of the barrel itself. Imaginary spelks click and stab at the palate as the tastes of the wine-soaked wood transfer from the liquid to the tongue. The angry ghosts of long-dead grapes rage on the senses, restless prison spirits that scream from the black nothingness beyond death row. The coffee and malt tastes of Sublime Chaos are still there but, while Sublime Chaos was a more or less balanced beer, Done Time is furiously out of kilter and completely glorious with it. It takes a while for the beer I remember from before it was sent up-river to come out from behind the screeching wood, and while it's still there it's safe to say that it's been irrevocably changed and skewed by its time in confinement. There is still the parching at the back of the throat that Sublime Chaos brought with it, like the gullet is coated with sugar-soaked Rizlas. Done Time dessicates and cloys and it's a quick drink because of this. It makes you thirsty and quenches it at the same time and that's either a problem or a solution depending on your level of temperance. It's still the lethally easy-drinking beer it was before its incarceration, still a 7% abv invigorator that could send a genteel drinking session dangerously sideways if it had the chance. It's not the same beer it was before it was sent down. Sublime Chaos was a thing of darkness and shadows, a beer for midnight insanity and intrigue. 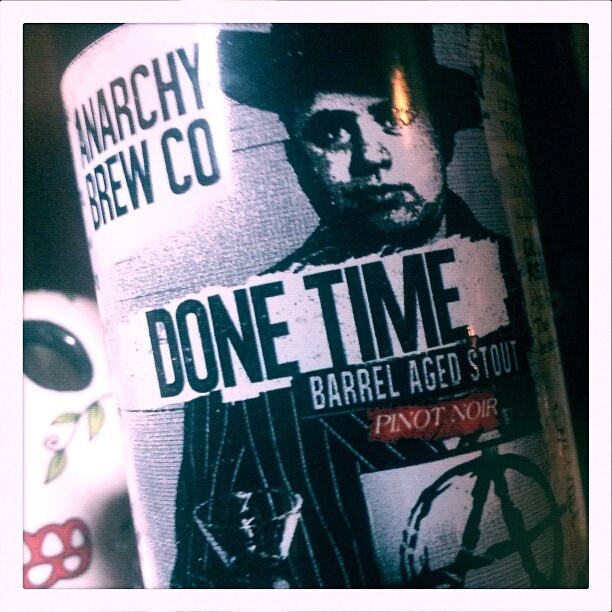 The Pinot Noir aged Done Time (there are also Whisky and Bourbon barrel aged versions) is a beast barely contained within flesh, an unleashed thing that snaps and rages and tastes just incredibly good. As the beer glass becomes a mostly-empty vessel, housing only a finger of beer and a a few spots of off-white lacing, the barrel's scent is still so strong that a really deep inhale can stab at the cough reflex like an overenthusiastic pull on a cigarette. The chocolate scent has become very strong by this point, the breakfast stout hat still fitting well on Done Time's prison-shaved head. The final mouthful, as Done Time leaves behind everything it has in jail but its rep, is a smooth and sugary combination of wine and chocolate malt, the very essence of barrel aging pared down into one concise sliver of flavour. The drinker's head is left warm, swelling from the delightful burn of the alcohol. The teeth and lips retain the smack of Pinot Noir. The regret at buying only one bottle is powerful. You've made my slightly afraid of this beer. It's out on parole and looking for revenge. I'll be looking over my shoulder nervously on my way home from work, staying clear of sultry alleyways and taking that longer detour rather than risk the unlit nocturnal country lanes.